Above: The Daily Record’s office at 11 East Saratoga Street in downtown Baltimore. 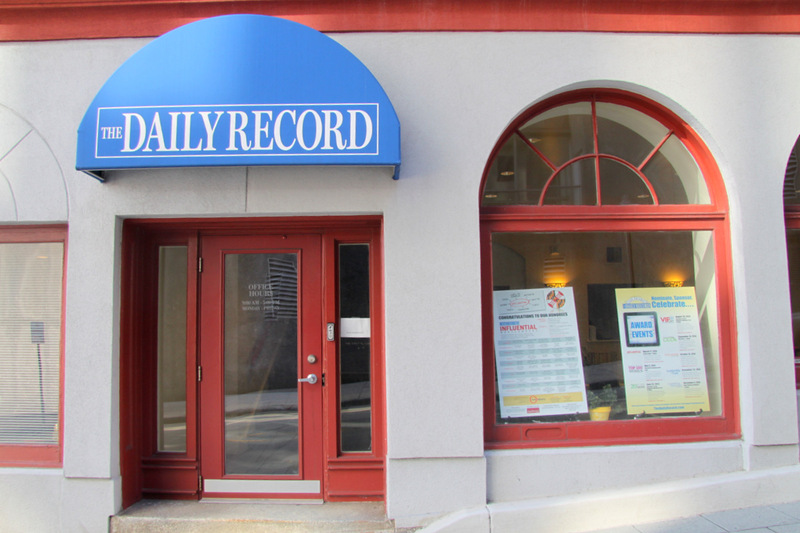 The Minneapolis-based owner of The Daily Record, a fixture in Baltimore’s legal and business community for more than a century, announced this morning that it will seek bankruptcy protection under Chapter 11. 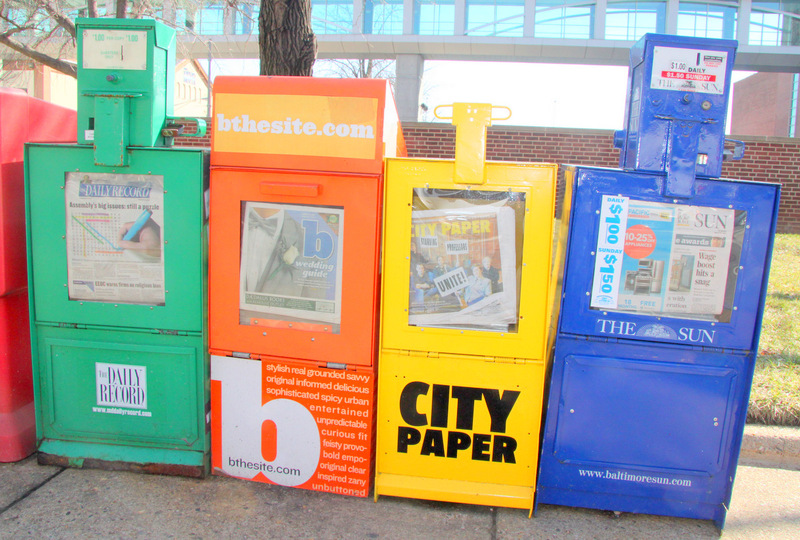 Today’s news comes on the heels of last month’s sale of Baltimore’s largest alternative newspaper, City Paper, to the Baltimore Sun Media Group, offering another sign of the turmoil and consolidation taking place within the traditional print-media sector. Last year, The Sun’s owner, The Tribune Co., emerged from four years of bankruptcy protection. It’s an open secret that Sun management is seeking to consolidate its facilities and staff. A Dolan Co. official told the Daily Record that the company expects a speedy exit from bankruptcy and continued operation of the company, including the publication of the Baltimore paper. “While the news of The Dolan Co. going into bankruptcy is concerning for all of us, let me assure you that The Daily Record is consistently profitable and has never lacked for investment. We are a strong operation with strong local leadership,” Suzanne Fischer-Huettner, publisher of the newspaper, said this morning. The paper, which publishes five days a week 52 weeks a year, was founded in 1888 by Edwin Warfield as a court and commercial newspaper. Warfield was later elected Maryland’s 45th governor, serving one term (1904-08). The paper remained in the Warfield family until the Dolan group’s purchase in 1994. According to the newpaper, voluntary bankruptcy petitions are expected to be filed in the U.S. Bankruptcy Court for the District of Delaware. The subsidiaries of Dolan Co. will be parties to these petitions, with the exception of its e-discovery business, DiscoverReady LLC, which will continue to operate as usual. “This reorganization step is necessary to unlock these current businesses from the weight of debt principally associated with its previous mortgage foreclosure processing businesses,” said Kevin Nystrom, who was named Dolan’s chief restructuring officer two months ago. The company said it is soliciting approval of the terms of the Chapter 11 reorganization plan from its secured lenders. That process should be complete at the end of this week. According to Dolan officials, the plan would allow the company to reorganize its capital structure, reducing its projected secured debt from $167 million to approximately $50 million. The restructuring is being accomplished by exchanging existing bank debt for equity ownership in the company. Secured lenders would then take ownership of the company once the Chapter 11 process is final, Dolan officials said. In January, the New York Stock Exchange delisted Dolan Co.’s common and preferred stock because the common stock’s share price had fallen below $1.00.